Over the last couple of years, duck hunting boats have varied and changed quickly but for duck hunters, choosing the right boat for their particular situation is still the same. The most important step in buying a type of duck hunting boat, including Jon boats is deciding what boat type will meet your particular needs for the area you hunt. For people who normally hunt on small potholes or sloughs and often have to use a push pole, a double pointed, light weight, small duck boat is idea and easy to drag if necessary. 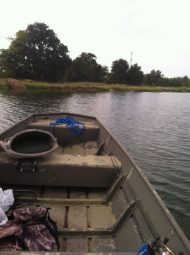 However, this type of duck boat is neither safe nor practical for the hunt on open, large lakes or big bodies of water. For hunters who hunt ducks in flooded timber, such as areas in Arkansas, duck hunting Jon boats with a mud motor or short shaft motor are ideal. Jon boats are wood or metal aluminum flat-bottomed boats, which they designed specifically for hunting and fishing activities. Duck hunting Jon boats normally have one to three seats, an outboard motor mount and are inexpensive, easy to maintain, have maximum usable space, and a simple design. There are several upgrade options available for hunters while shopping for Jon boats. 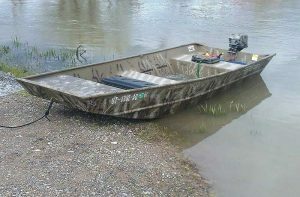 Many hunters are finding Jon boats ideal for lakes and rivers with weed patches and shallow backwaters to navigate through. When choosing a Jon boat or any duck hunting boat, take into consideration the number of people you will normally have in your boat. If you hunt alone or with one other duck hunter, you only need a boat large enough to be safe. For someone who hunts in flooded timber with a couple of friends and a dog, you need a much bigger boat. Two hunters plus their gear fit into twelve-foot Jon boats but Jon boats sixteen feet or longer are necessary for more than two guys and their gear. Selecting duck hunting boats or Jon boats that meet your needs is not difficult, if you take into consideration the area where you hunt and how many hunters, how much gear, or even hunting dogs, will normally be in your boat. For duck hunting Jon boats used in very shallow water, a mud motor is an excellent choice and maximizes the boats design. Using mud motors on Jon boats where there is an excessive growth of weeds is a far better option than using an outboard style engine.